Kalamazoo, MI - September 14, 2016 The Kalamazoo Symphony Orchestra Board of Directors and Raymond Harvey, Music Director, announce the transition of Maestro Harvey to Music Director Emeritus at the conclusion of the 2016-17 concert season. As Maestro Harvey finishes his time with the KSO to continue in his role in Houston, he will return to Kalamazoo once a year, in the role of Music Director Emeritus, to conduct a concert with the orchestra. 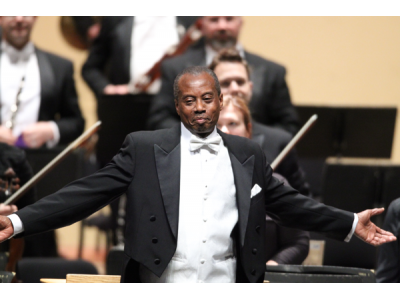 2016-17 will be a celebratory season, filled with opportunities to reflect on Maestro Harvey’s time with the Kalamazoo Symphony Orchestra and to celebrate the legacy that he leaves with our community. Plans are already in the works to convene a search committee that will be tasked with finding Raymond’s successor. The search process will be by invitation only. Daniel Brier, our Resident Conductor, will provide continuity through this time of transition – working with the orchestra in his usual capacity but extending his time and talents as needed during the search process. We are confident that the new Music Director will join the committed team already in place to move the KSO forward in realizing its vision for the future, as laid out clearly in our important Strategic Plan.